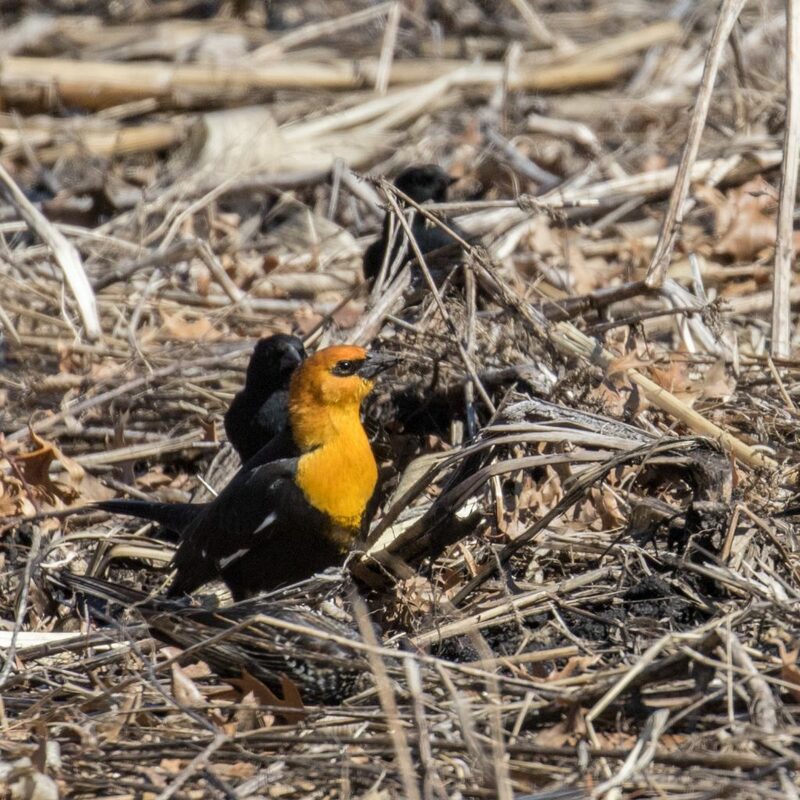 I don’t know if I have premonitions or if I just think this way all the time and when it happens it becomes a premonition in my mind, but I was sorting through a flock of mixed blackbirds on Lynch Avenue in the black dirt this afternoon and I suddenly thought that I was going to see a YELLOW-HEADED BLACKBIRD. As immediately as I had the thought, bam! 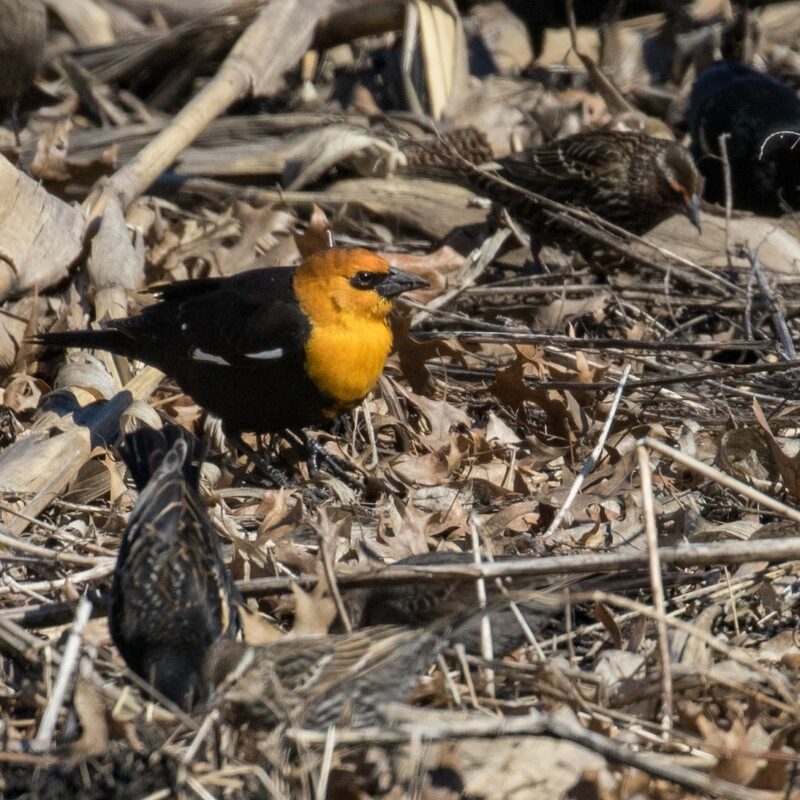 there was a Yellow-headed Blackbird in my binoculars! I couldn’t believe my eyes! After initially freaking out, I quickly grabbed my camera and took some quick shots through my passenger side window. I put the word out, and of course as soon as I did that, the flock picked up and relocated across the street in a small patch of woods. I relocated the bird three times as the flock shifted and moved through the woods, but by the time anyone showed up I’d lost track of the bird. Maria Loukeris, Karen Miller, and John Haas were the first birders to arrive. We staked out the area initially, but then a large number of the birds took off and headed south and WAY out into the fields. By the time Bruce Nott and Rick Hansen showed up, we were dividing up and driving around looking. Bruce located a large flock, very distant, at the south end of Lynch and everyone eventually joined him, as did Gail Benson and Tom Burke. And it was Bruce who finally relocated the bird (way to go Bruce!) – in the center of a tree way across the field. Everyone present got on the bird and everyone was really excited about this bird! John was thrilled because YHBL has been an OC nemesis bird for him for quite some time. Rick told me it was a lifer for him. I’m sure for others it was either a county bird or a state bird; for me it was both (I’d gotten my lifer in Colorado a few years back). What a great birding experience, I was so happy that Bruce relocated it and that other birders also got to enjoy the bird. What wonderful shots, Matt, and congratulations on a fabulous find! Despite the fact that I was exhausted from walking the Liberty Loop this morning in the wind and cold, I did manage to get there and see this beautiful bird. Even though it was a distance, it definitely stood out! Thanks for putting the word out. Keep those premonitions coming! Wow- is an understatement. Congratulations on a great find! Enjoying your photographs and exciting experiences with the group. I’m in the Philippines now, with limited internet access. I wish I could tell you that I’m at place where fauna abounds but I’m amidst buildings instead. CONGRATULATIONS Matt! Excellent find and this is at least the 3rd time for the County that I know of. It was a much added plus that so many others got to see it and I KNOW that John Haas was delighted because of recent misses. Congrats on your providential find! BP male, and a photo from the window, too, you lucky duck. Good for you and all the others!